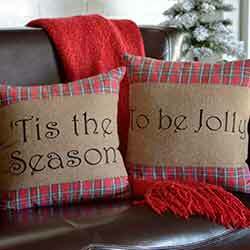 Decorative Pillows are a quick and easy way to add holiday festivity to any room! Available in many styles and themes to fit any decor, we have country, primitive, lodge, farmhouse, coastal looks and more! The holidays can be a great reminder each year to enjoy life. 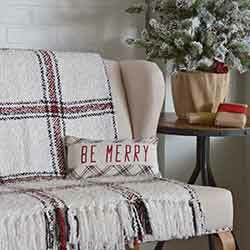 The filled Amory Be Merry Pillow 7x13, with its fresh ivory, brick red, and black plaid proudly displays its message, all while providing the comfort of cotton and felt. A reminder to have a little fun this year, the filled Amory Naughty and Nice Pillow Set of 2 7x13, is sure to be a favorite holiday accessory. you willfind an embroidered Naughty on one pillow and Nice on the second. Bring a touch of the urban holiday look into your room with the filled Amory Plaid Pillow 16x16. The plaid consists of a tasteful display of ivory, brick red, and black. A touch of big, bold rustic design makes the filled Anderson Patchwork Pillow 16x16 a wonderful addition to most any home. Enjoy the alternating patches of cherry red, iron grey, and marshmallow plaid on soft herringbone weave felt. 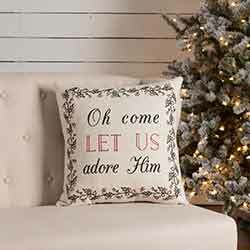 Invite all who grace your home with the Anderson Seasons Greetings filled pillow set as it displays a traditional holiday greeting. Season's is embroidered on one pillow and Greetings on the other. The little pillows with a big heart! 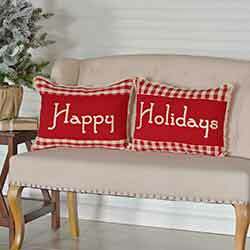 The Anderson Warm Wishes Pillow Set of 2 12x12 exude the congeniality of the season. Warm is embroidered on the first pillow and Wishes on the second. Can't get enough stockings? 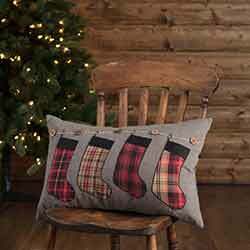 The 14x22 Andes Stocking Pillow features four different plaid - red, black, and tan - stocking motifs on a grey chambray base. 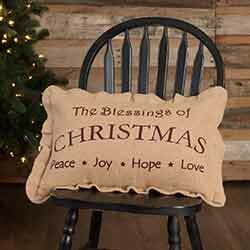 The 14x22 Begins with Christ Pillow sends a proud reminder about why we celebrate Christmas. 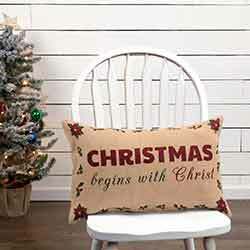 Wording states, CHRISTMAS begins with Christ in traditional red and green on a soft but textured jute background. 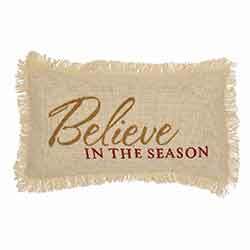 Our Creme Burlap Pillow Believe In The Season 7x13 is a soft cotton with gold and red stenciled Believe In The Season. 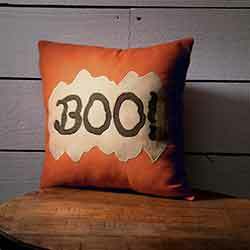 The Boo Pillow 12x12 is a scary good time with its orange cotton base with khaki and ectoplasm applique. Boo! embroidered in chocolate duck cloth cotton for spooky fun. 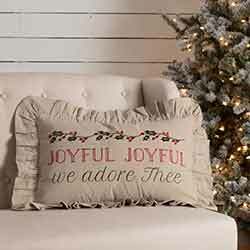 The 14x22 Carol Joyful Pillow is a medley of holiday cheer with holly berry vine stenciling, timeless carol lyrics, and 3-inch ruffle trim. JOYFUL JOYFUL we adore Thee is stenciled in red and green on a khaki chambray base. The 14x22 Carol Trimmings Pillow is a medley of holiday cheer with a 3-inch floral print on creme trim and a cute Christmas blessing. CHRISTMAS is love with all the trimmings is stenciled in red and green on a khaki chambray base. The Celebrate Pillow brings out the warmth of Christmas with its jacquard khaki and golden adornment. Its flap is trimmed with metallic golden lace and ribbon, with gold ball trim. Features a khaki gold lurex chambray base with two vertical panels in bronze jacquard. 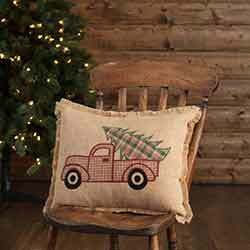 The 14x18 Clement Applique Truck Pillow features frayed edges and a vintage 1950s inspired red-plaid farm truck hauling a too-big-to-fit plaid evergreen tree on a solid jute background. 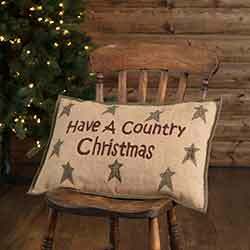 The 14x22 Country Christmas Pillow features 9 appliqued primitive stars with double plaid surrounding the words Have A Country Christmas in red crewel stitching. DThis rustic pillow is both decorative and functional - front size shows a letter to Santa humorously saying "Dear Santa, I can explain!" Deer Country Pillow, by Tag. Part of the Nordic Winter Collection. 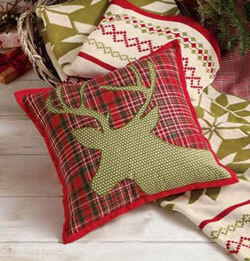 Features plaid designs inspired by a traditional Scandinavian holiday and embroidered deer. Measures 16 inches. 100% cotton. Filled pillow insert, hidden zippered closure. 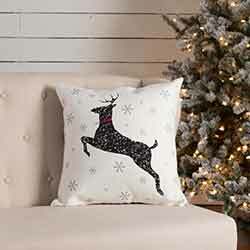 The 18x18 Emmie Deer Pillow has a leaping deer silhouette in distressed stenciling and embroidered red collar with a silver bell so children can hear Santa as he delivers presents. 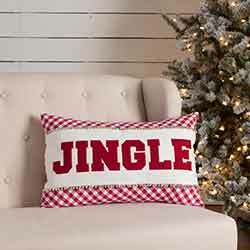 The 14x22 Emmie Jingle Pillow features red JINGLE lettering on bright white cotton between a red check bias boarder with silver bells. 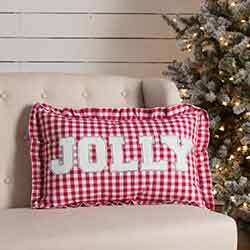 The 14x22 Emmie Jolly Pillow features red JOLLY lettering on red checks. Trimmed with ruffles and reverses to red and white check. 100% cotton with polyester fill. 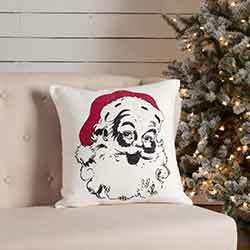 The 18x18 Emmie Vintage Santa Pillow showcases a head shot of a happy Kris Kringle in distressed black stenciling. 100% cotton shell with polyester fill. 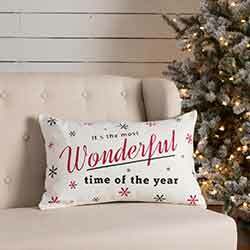 The 14x22 Emmie Wonderful Time Pillow features classic lyrics Its the most Wonderful time of the year in beautiful typography. 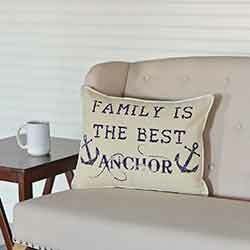 The Family Anchor Pillow 14x18 displays a timely message in a timeless design. The filled pillow features a textured creme cotton canvas with a stenciled Family is the Best Anchor in navy. Two wooden closures on reverse. The Gavin Pillow Set of 2 16x16 looks to bring to a smile to everyone's face this year. Tis the Season is embroidered on the first pillow, and To be Jolly on the second. 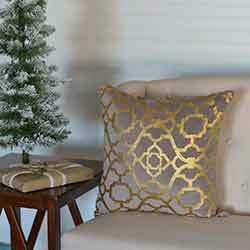 Pleasingly graceful, the Gold Foil Pillow 18x18 comes filled and is adorned with a gold foil majolical pattern over a grey-taupe velvet. Reverses to two wooden closures. 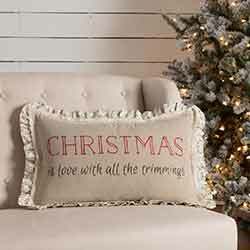 The Gretchen 12x12 Pillow exudes the joy and wonder of a timeless Christmas with its seasonal colors and unique railroad and pom pom lace detail running diagonally down the front. The Gretchen Pillow Set of 2 14x18 is a welcoming and warm addition to any home. The pillows are filled and have Happy embroidered in creme-colored thread on first pillow and Holidays on the second. Memories of decorating gingerbread men, piping sugar cookies, and making holiday crafts inspired us to create the Have Yourself a Merry Little Christmas Pillow set. 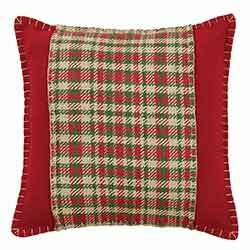 Forest green, cherry red and creme cotton plaid playfully decorates the HO HO Holiday Pillow 18x18. 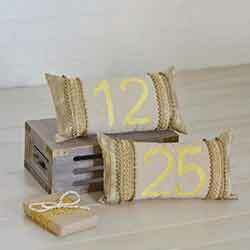 The festive wording is appliqued in creme felt with gold rope detail. 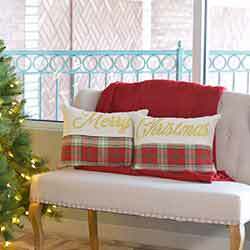 Forest green, cherry red and creme cotton plaid playfully decorates the HO HO Holiday Pillow Set of 2 14x18. 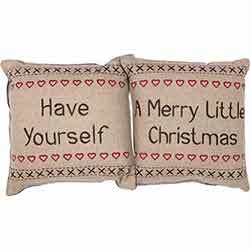 Merry is embroidered on the first pillow and Christmas on the second, both in shimmery gold thread over felt. 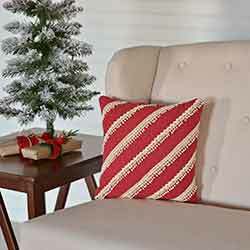 Forest green, cherry red and creme cotton plaid playfully decorates the HO HO Holiday Pillow Set of 3 12x12. 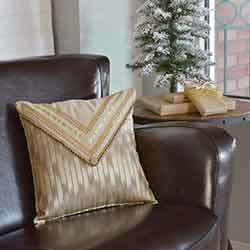 HO is appliqued in creme felt on each pillow; adorned with festive gold rope detail. 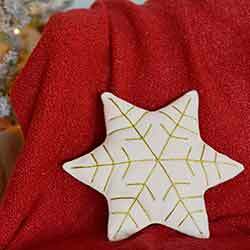 The playfulness of the HO HO Holiday Snowflake Pillow 14x12 is detailed with gold rope embroidery and antique brass zipper teeth trim. Reverses to forest green, cherry red and creme cotton plaid. 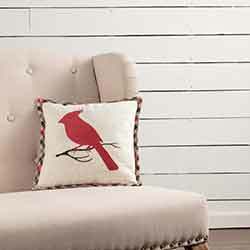 The 12x12 Hollis Cardinal Pillow features a Holly Berry Red bird on a winter branch surrounded with an ivory cotton flax fabric. 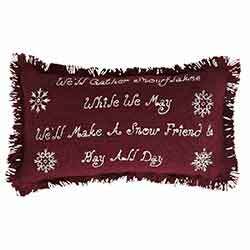 The 18x18 Hollis Oh Come Let Us Pillow features famous words from the classic Christmas hymn placed on ivory cotton flax and surrounded by holly berries. 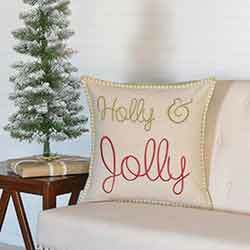 The Burl Ives classic song comes to mind with the Holly & Jolly Pillow 18x18. The pillow is generously sized and features a khaki cotton chambray with an embroidered Holly & in moss green and Jolly in crimson.